[4 mins. 45 secs.] This episode of Filmwax Radio is the result of our first live podcast. 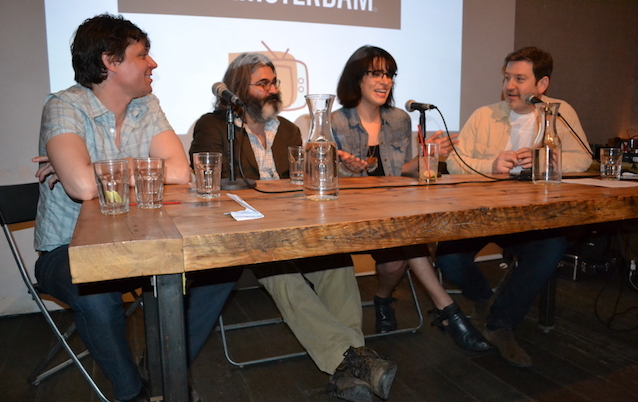 The event took place at Videology in Williamsburg, Brooklyn on Saturday, April 12th. Guests included Director of Programming at Rooftop Films, Dan Nuxoll, and filmmakers Onur Tukel, Desiree Akhavan and Gillian Robespierre. The event was sponsored by New Amsterdam Spirits and presented by Rooftop Films. The podcast begins with a chat with Dan Nuxoll about the coming season of Rooftop Films which begins the weekend of May 16th. After that I bring on Onur Tukel ("Richard's Wedding") who talks about making his latest film, "Summer of Blood", which just had its world premiere at the Tribeca Film Festival this month. After that I bring up Desiree Akhavan who had a hit with her new film, "Appropriate Behavior", at this year's Sundance Film Festival. Desiree is also known for her popular web series, "The Slope", but she's also part of the Brooklyn Filmmakers Collective. Last up is Gillian Robespierre, director of the other Sundance hit comedy, "Obvious Child". Both "Appropriate Behavior" and "Obvious Child" will screen at Rooftop Films this summer. Check their schedule for details. "Obvious Child" will also be in theaters beginning June 6th.